In his much-cited 1993 essay E Unibus Pluram: Television and U.S. Fiction, David Foster Wallace bemoans what he then saw as the rise of a mode of hyper-referential, pop/junk-culture-splattered fiction, one where “velocity and vividness—the wow—replace the literary hmm of actual development,” that in lieu of plot or character favours moods, the “antic anxiety, the over-stimulated stasis of too many choices and no chooser’s manual, irreverent brashness toward televisual reality,” and—like television or other similarly clipped fields of entertainment (Wallace, writing in the nineties, naturally focuses on TV, but his arguments are easily transposed to today’s even vaster glut) operate in images, rather than quaint notions of emotionality. In pursuit of surface realism, there is risk of forsaking heaviness, or timelessness, or truth. As in every era, today’s crankers-out of culture face this squirrely dilemma of realism: just how far the boundaries of mundane contemporaneity can or should extend, and how useful any parameters therein might be delineated—that is, the question of how realism should be defined right now, and whether such a classification matters, or even exists. If an author adopts or mangles forms anchored explicitly in “today,” is such a thing inherently parodic, or just being true to the times? It is certainly possible to write fiction about Facebook (and, oh, it is done), but do we find this acceptable? 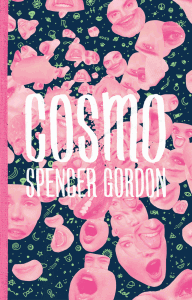 Spencer Gordon’s new short story collection Cosmo enthusiastically elbows its way into that mosh pit of a question with equal measures vigour and charm. Though offering a gaudy all-you-can-eat spread of pop/junk cultural references, the book selects its menu wisely, hitting both the salad bar and the sundae counter in equal measures, as it were. Gordon is unafraid, for example, to hinge a lengthy passage around the single word “YouTube”—describing how, for one character in distress, the word rings “like black magic, a sinister open sesame to some sealed chamber inside her”—and it’s, for the most part, not only convincing, but stirring.